 Home  loans  How easy is installment loans? "If I only need ID documents, no proof of income, I can still borrow money from the finance company easily," said Nguyen Van Nam. 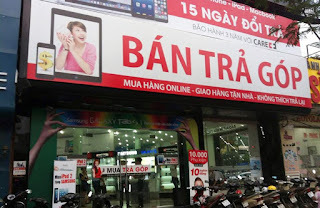 Born in 1991, Mr. Nguyen Van Nam, residing in Yen Phong, Bac Ninh, is one of many regular customers of electronics supermarkets. Nearly a year ago, many people in the area were surprised when Mr. Nam bought a lot of modern equipment in the house, from big screen TV, washing machine to air conditioner. “Just go to the supermarket, I need a loan as a counselor. I just need to have identification papers, household registration books that people just watch and do not keep. Anything you want to borrow, ”Mr. Nam said. Mr. Nam said that it is easy for companies to check and approve loan applications even for first-time borrowers. Customers who want to borrow, companies want to lend and supermarkets want to sell goods, so everyone wants to borrow smoothly. “Employees only ask how much income they do not see labor contracts or proof of income. There was a time when the installment purchase was too high, the staff also advised me to declare higher income to make the file easier to approve, ”Mr. Nam said. He also said that the couple took turns in different loans, so they bought many equipment through such installments. There is no stable income but Mr. Nam also buys installment products to use, when he can no longer repay the debt, he will pay for the installment. However, many students, who have no stable income in Hanoi, take advantage of installment loans as a "hot" loan when urgently needing money. By borrowing money to buy the latest phones via installments, then resell to a few other acquaintances at a lower price, Nguyen Van Thai (Nghe An village), a third year student of a great university Studying at Cau Giay, you can eat 10 million VND difference per phone. Thai products are aimed at new and valuable phone models but are being offered 0% installment payment by lenders. "Student loan is easier than working people, income is not available, so just declare how much money your family has to pay each month, ask friends to fake relatives to answer a few questions of the company calling is easy to borrow, ”Thai said. Many new mobile phones are repaid by lenders with 0% interest. In the same way, Thai borrowed and bought 2 new phones and sold them to acquaintances at 20-30% cheaper than the store price, taking the difference. Thai said that once the company lent the reference phone number to confirm some information, but in many cases the lender did not call for confirmation but also lent. “When the installment payment is due, it is impossible for anyone to borrow more. I also did not pay money to people, I still rotate my money to pay the debt in full, ”Thai said. Thai also said that many people also borrowed their installments, but after a while could not turn the money and changed the phone number, owed the lender. Ms. Thuy Dung (29 years old, from Bac Ninh) used to be a consumer loan counselor or two years ago, each installment loan agreement was successfully approved, the counselor will receive 200,000-300,000 VND. depending on outstanding debt. She also has many debt cases when buying installments. In these cases, the consultant is cut off all commissions, even if there are many bad debt contracts will be forced to quit. She added that there are many cases where customers buy phones and immediately ask to resell directly to the store, when not accepted, they also take away to sell for cash. “Once there was a student after buying installments, the phone was resold to a companion with me to get cash. That contract after 2 months also no longer saw payment of installments, causing me to explain on the company because of this loan, ”Dung said. Why are high consumer loan interest? "Banks are allowed to mobilize capital from the population, while financial companies are not, and the cost of capital of financial companies is much higher than that of banks," Luc said. Experts also said that consumer lending companies often have to get capital from re-borrowing from banks or other financial companies, with interest rates of up to 10-15% / year. Besides, Mr. Luc said that high interest rates partly came from very fast lending procedures, disbursed at the time of borrowing. Therefore, the cost of basic investment and employees on each loan of these companies is also higher than that of banks.